DJ and producer Will Eastman's sets are known to expertly move people with narratives of house, techno, disco and left-field gems, earning him the title "one of Washington's titan DJs" from the Washington Post. Eastman has been a member of numerous bands since age 15 and brings a fiercely independent spirit to his DJ and music production approach, pushing boundaries with new sounds and unexpected juxtapositions. His releases and remixes have received broad support from a diverse range of DJs including Daniel Avery and Aeroplane and have been featured by BBC Radio 1, FACT Magazine, and Urb among many others. As 1/3 of Volta Bureau, Eastman topped the Beatport indie dance charts for an unprecedented 6 months in 2012 with "Alley Cat". The Washington City Paper describes Volta Bureau's sound as "bottled bliss, pitch-shifting already-shimmery sounds in the direction of heaven." Eastman has appeared in clubs throughout the U.S. such as Smart Bar and Electric Pickle and at major festivals like Virgin Mobile Freefest and Identity Festival. A music curator as well as creator, in 2000, he founded DC's longest standing emerging dance music club night and blog, Blisspop. 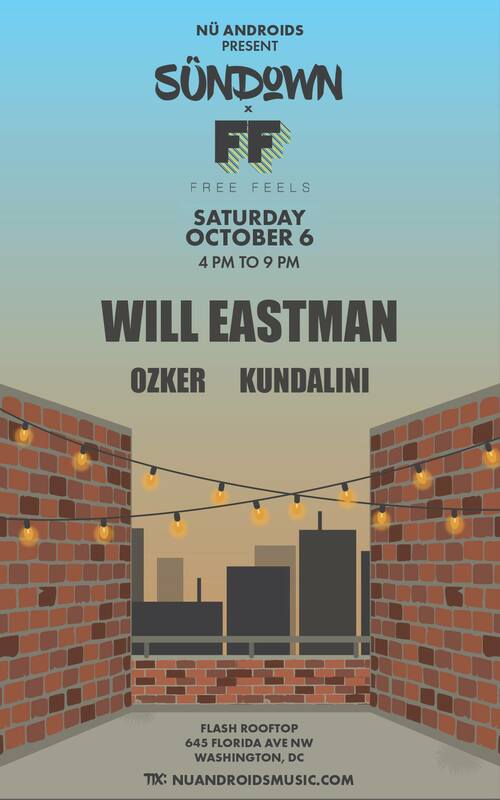 Eastman is the principle owner and music director of U Street Music Hall, named a top 10 dance club in America by Rolling Stone and "best dance club in the region" by the Washington Post. Trained as a museum specialist and historian, Eastman previously worked for the Smithsonian's Lemelson Center at the National Museum of American History where he documented the history of the electric guitar, electronic music and sound recording technologies before dedicating himself to a DJ and music production career. While the District of Columbia has seen a fluctuation of creative types recently, few artists have influenced the scene as prolifically as OZKER. Organic and locally grown, OZKER has established himself in the past few years as one of DC's hardest working DJ, Party Promoter, Producer and Visual Artist, all the while spreading that undeniable aura of being a loveable huggable type of guy. His devotion to the infectious groove and its counterpart, the bottomless beat, is matched only by his devotion to that trademark follicle foliage that you're bound to see bobbing up and down behind turntables throughout the city! OZKER has opened for such noted talent as Dillon Francis, The Bloody Beetroots, Will Eastman, Gigamesh, Classixx, Tensnake, Oliver, The 2 Bears, Bit Funk, Anna Lunoe & Nickodemus, amongst many others. He holds several monthly residencies in the city, including nights at Eighteenth St Lounge, Dodge City, Marvin, Velvet Lounge and The Looking Glass.